A simple recipe for rich, creamy Instant Pot dulce de leche. Easy to make, delicious, and foolproof! 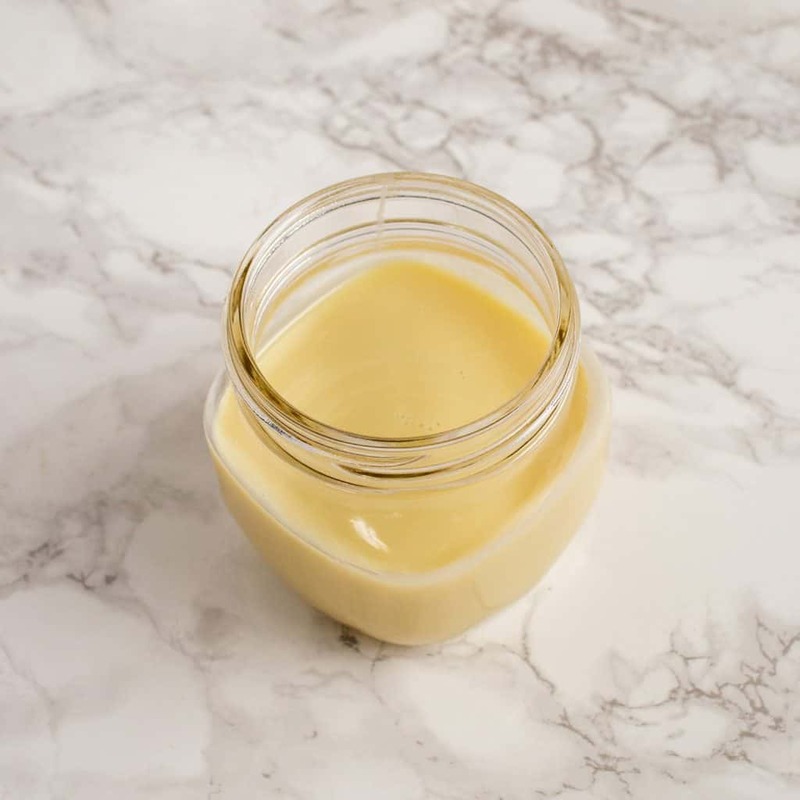 Sweetened condensed milk has long been a favorite ingredient of mine – I love it in Vietnamese iced coffee, in delicious lattes at my local coffee shop, and also in tasty no-churn ice cream. And it’s the secret and only ingredient in rich, creamy, delightful dulce de leche. Why make this rather than buying it from the store? Because it tastes so good and it’s fun to make things from scratch! If you don’t have time, buy a can of dulce de leche from the store. But if you have a bit of time (it’s mostly hands-off), then try this delicious recipe and everyone will be impressed! Dulce de leche (meaning candy of milk) is a rich, caramel-like sauce often used in Latin desserts. While caramel and dulce de leche taste similar, the processes to make them are different. 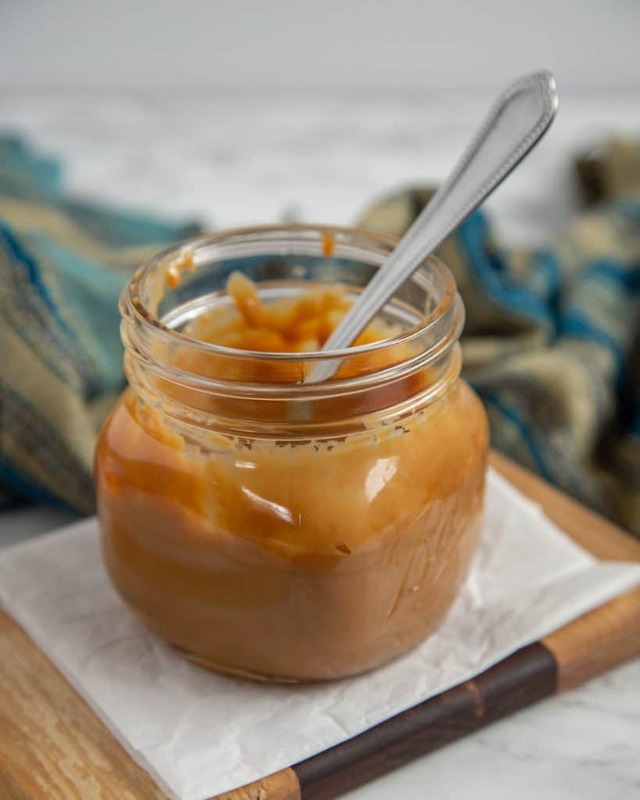 Caramel is made by heating sugar while dulce de leche is made by heating milk and sugar together (or sweetened condensed milk to speed up the process). The delicious dulce de leche flavor comes from the Maillard reaction, a chemical reaction between reducing sugars and amino acids. This is the same chemical reaction that gives a golden brown crust for brioche, the flavor of roasted meats, and the color of maple syrup. If you already have an Instant Pot, you know all of this already. But if you have not jumped on the Instant Pot bandwagon yet, this section is for you. An Instant Pot is a brand name of multi-use, programmable electric pressure cookers. 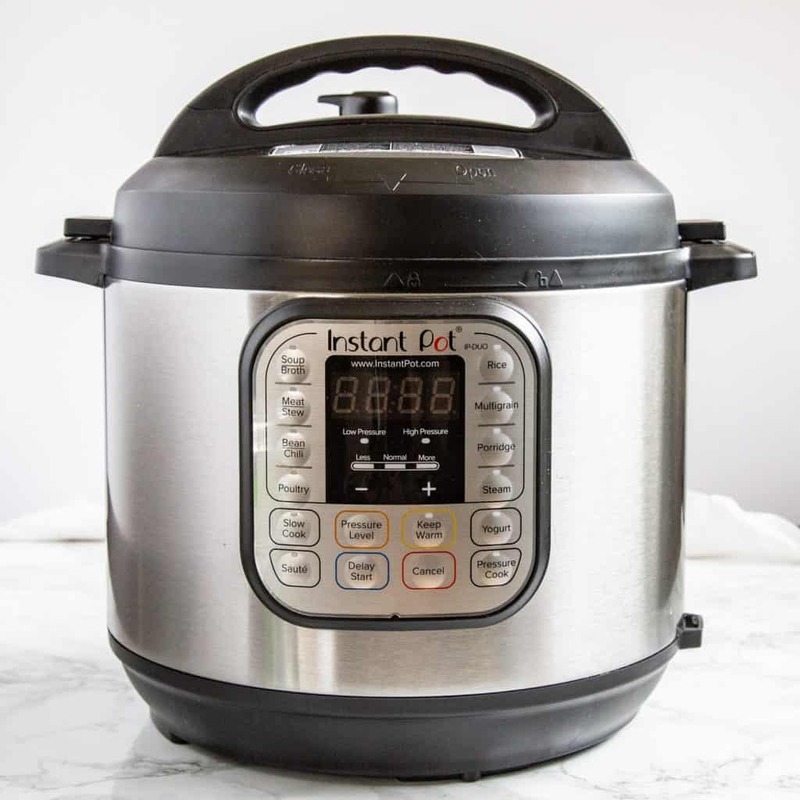 The Instant Pot brand offers several different sizes and there are a number of other brands on the market as well with similar features. I have the Instant Pot Duo 6qt, so all of my instructions are based on that one. All of the pressure cookers brands and models are pretty similar; they just name things a bit differently, so refer to your manual if I reference a button that you don’t have on yours – or leave a comment in the notes and I’ll try to help you out! There are many methods to make dulce de leche. Many stovetop recipes call for boiling an unopened can of sweetened condensed milk, watching the pot to make sure that the can stays submerged in the water. You can pour into a pie plate and roast in a water bath in the oven for almost two hours. Or you can use this super simple Instant Pot recipe that doesn’t require you to boil an unopened can (the thought of that has always scared me) or heat up your house by roasting in the oven. 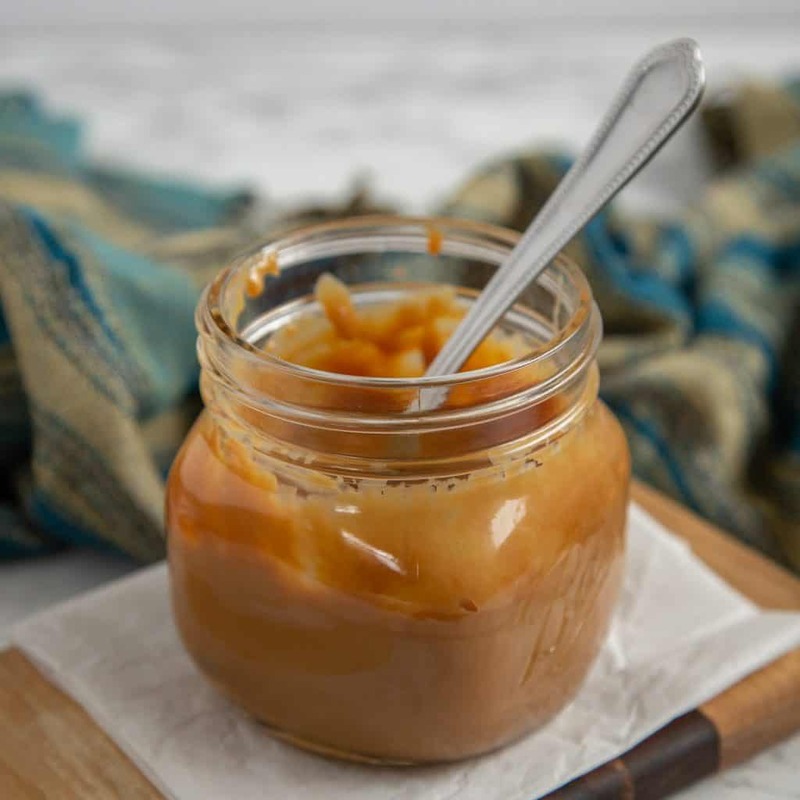 To make Instant Pot Dulce de Leche, open a 14 oz can of sweetened condensed milk and pour into a 16 oz or larger glass canning jar. Cover the jar tightly with foil. The foil will keep the steam from dripping into the jar. Place a trivet in the bottom of the Instant Pot. 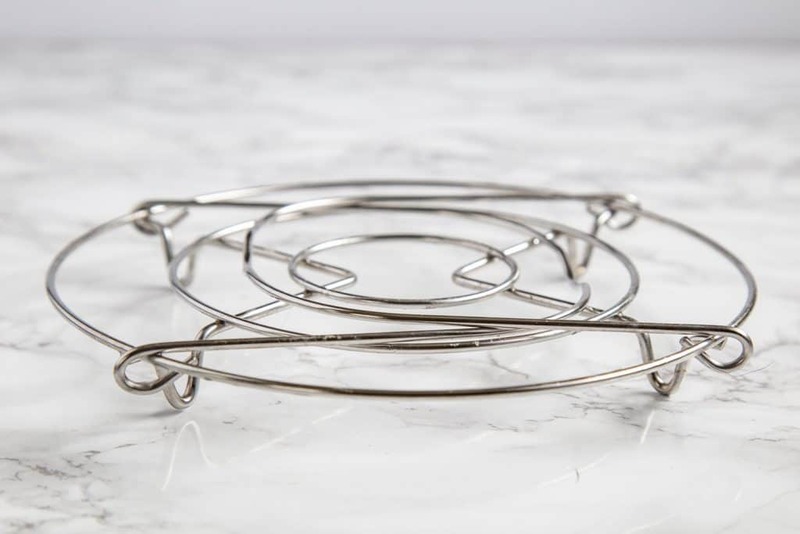 The trivet that came with the Instant Pot is perfect for this recipe, or use another short trivet like this one. 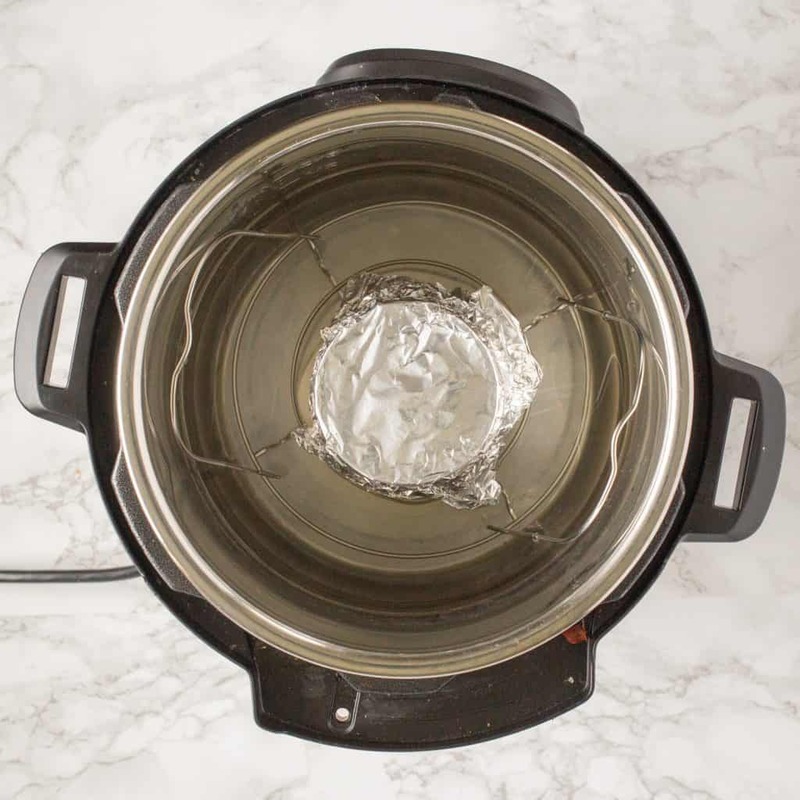 Place the foil-covered jar on top of the rack, then add water to the Instant Pot until the water reaches halfway up the jar. Lock the Instant Pot lid in place and close the pressure release valve. Press the “Pressure Cook” or “Manual” button until it’s on “Normal” and then press the “Pressure Level” button until it’s on “Normal”. Press the +/- button until you get to “00:35” or 35 minutes. When the Instant Pot is done, press “Cancel” to turn off the Instant Pot, then just leave it sit for 15 minutes to allow the pressure to release naturally. After 15 minutes, quick release the rest of the pressure by opening the pressure release valve. Using an oven mitt or kitchen tongs, carefully remove the jar from the Instant Pot. Let it cool for about 10 minutes, and then carefully remove the foil and stir the dulce de leche well. Store covered in the refrigerator. 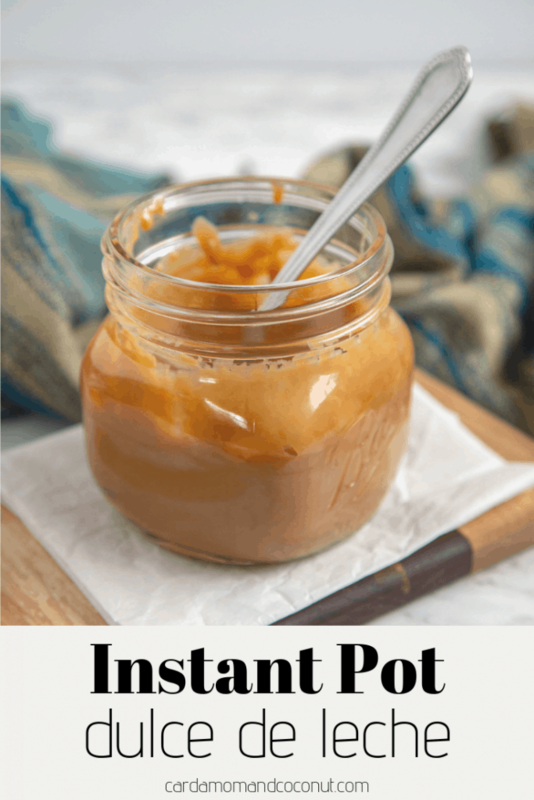 If you try this recipe for Instant Pot Dulce de Leche, leave a comment and a review below and let me know how you used it! Open the can of sweetened condensed milk and pour into a 16 oz glass canning jar. 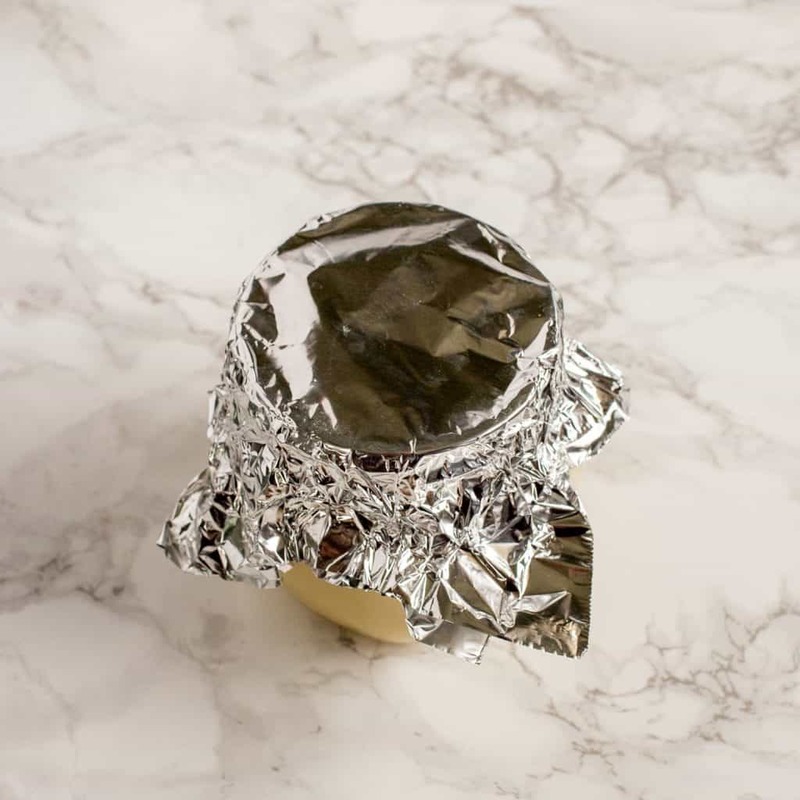 Cover the jar tightly with foil. Place a trivet in the bottom of the Instant Pot (the trivet that came with the Instant Pot is perfect here). Place the filled, foil-covered jar on the rack. Pour enough water into the Instant Pot so that the water reaches halfway up the side of the jar. Lock the lid in place. Close the pressure release valve and press the “Pressure Cook” button until it’s on “Normal”. Press the “Pressure Level” button until its on “High”. Then press the +/- buttons until the display says 00:35 for 35 minutes. When the Instant Pot is done, press “Cancel” to turn off the Instant Pot. Then just leave it sit for 15 minutes to naturally release the pressure. Quick release the remaining pressure by opening the pressure release valve, steering clear of the steam. Using an oven mitt or tongs, carefully remove the jar from the Instant Pot. Let it cool for 10 minutes, then carefully open the jar using an oven mitt. Stir thoroughly. Store leftover dulce de leche in the refrigerator. WOAHHH what!? I had no idea it was this easy to make dulce de leche in my instant pot. I am SO making this! Thank you so much for the easy instructions! 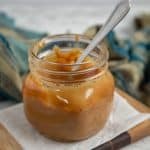 I love making dulce de leche but I had no idea I could make it in my InstantPot!! Super excited to give it a try soon! I still havent gotten on the Instant Pot train, but recipes like these make me reconsider. I, also, am a fan of dulce de leche and I think a person would be insane if they didn’t like it. What’s not to like? Thanks for sharing this great recipe and maybe you inspired me to finally get an IP. This looks so good, I am definitely going to have to try it in my Instant Pot! Such an easy recipe and it turned out perfect! YUM!! !